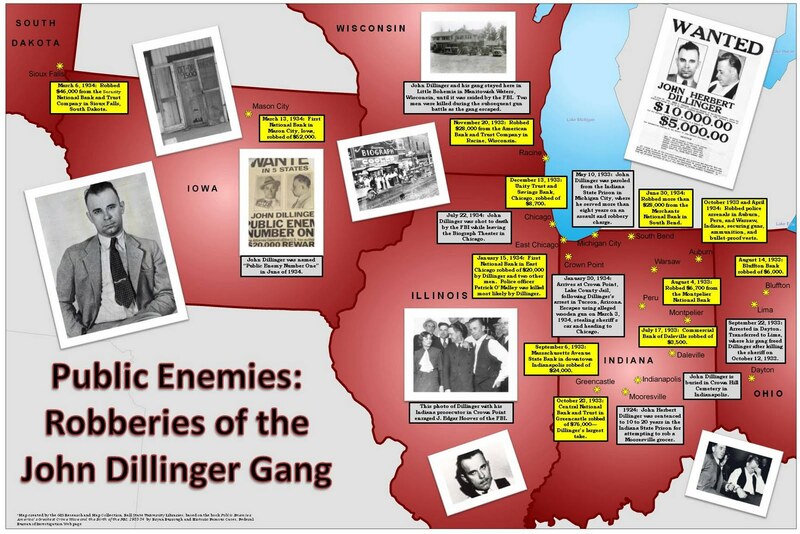 The GIS Research and Map Collection (GRMC) created the map Public Enemies: Robberies of the John Dillinger Gang (click to enlarge above) based on information from a book by Bryan Burrough, Public Enemies: America’s Greatest Crime Wave and the Birth of the FBI, 1933-1934 (available from the General Collection of Bracken Library) and the Federal Bureau of Investigation Historic Famous Cases Web page. The movie Public Enemies starring Johnny Depp is also based on the Burrough book. 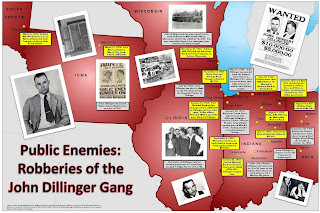 John Dillinger was a legendary bank robber from Indiana who became America’s first “Public Enemy Number One.” The map marks the locations of reported robberies of Dillinger and his gang beginning with a robbery in Daleville, Indiana in the summer of 1933. Other events related to Dillinger are also featured on the map, including the location of his death in Chicago on this day—July 22—in 1934. A copy of the map is available in PDF-format from the Ball State University Libraries’ Cardinal Scholar repository at http://cardinalscholar.bsu.edu/handle/123456789/194224. The map is available for circulation for two weeks or longer. Additional printed copies of the map may be obtained from the GRMC weekdays from 7:30 to 4:30. Contact the staff for more information at 765-285-1097.